1. We took the light rail to the circus because if you are attending an event at US Airways you can ride the rail for free, and parking at the light rail stations is always free! WIN WIN! Unless it is one hundred some degrees outside, it is LOSE LOSE for mommy, but I sucked it up and pretended to be adventurous and fun! 2. The pre-show where you can get up close and personal with the entertainers is better than the actual circus! SERIOUSLY, you are standing right there, and they grab participants from the crowd, it is AWESOME! I would recommend going the next time the circus comes to your town. AND, it isn't as crowded as you would think because they have multiple areas and things to do! 3. They handed out clown noses, Jackson thought they were hysterical. Tyler wasn't too sure about them at first, but she has been walking around with it on a lot at home. She doesn't like to try things right away, but when she warms up, she eventually realizes she likes it. 4. Jackson and Jim tried on some of the costumes, I wish the picture of Jim was better because it was funny, but I was across the arena when he was trying it on, and thought it was too funny to at least not TRY and get a picture. 5. My favorite was the stilt walkers. The amount of control they have on those things is amazing! You may be able to see the announcer guy looking up in this picture, do you see him looking, right over my shoulder,that's because the big blue stilt walker was RIGHT NEXT TO ME, stomping through! SCARE THE SH*T out of Jackson and I! I shrieked! 6. In my opinion, the circus is seriously one of my favorite events. BUT, I feel that this circus was so over the top, I couldn't follow what was going on. They have done away with the whole concept of "Three Ring Circus", and I don't know if it was that, but I guess I REALLY need the rings to be able to follow what was going on. They did different activities at the same time, and my A.D.D self just COULD NOT FOLLOW IT! The entrance and exit was like a zoo, Disney on Ice, parade, and circus combined in one. I am sure I missed a million and one things, and wish I could have just focused on one thing at a time. 7. Jackson like the motorcycles in the cage. 8. Tyler liked the tigers. 9. We left at intermission, probably so Pat could find the nearest bar and watch the soccer game, though he won't admit it! He likes to blame it on Tyler being tired, even though she sat at a bar for two hours watching soccer! 10. Don't forget to enter the giveaway, ends Thursday 11:59 PM MST! Recently, I teamed up with California Pizza Kitchen to try their new menu items just released for the summer. Anyone who knows me, knows I love to eat and try new things, so in my opinion, this was the PERFECT assignment. Armed with my "pizza dough" (California Pizza Kitchen money) and my pickiest eaters: Patrick, Jackson and Tyler, we headed out to taste test. I knew if something wasn't delicious, they would be the FIRST to tell me. One of my MOST FAVORITE things about CPK is their Menu Adventure Guarantee that states, "Be adventurous—try something new! If it doesn't thrill you, we'll replace it with one of your usual favorites!" HOW FABULOUS IS THAT? You can try something new, RISK FREE! I know I am a huge fan of trying new things, but that doesn't mean I don't have my standard favorite (Tostada Pizza with Grilled Lime Chicken)! Knowing that if something doesn't thrill you, you can send it back and get your standard favorite is definitely a BONUS! We arrived at the Desert Ridge location last night and couldn't wait to stuff our bellies! The first question my kids ask when we are going out is if the place we are going to has a coloring sheet. They will often choose the restaurant they want to go to based on the coloring sheet. CPK doesn't have a coloring sheet, they have a coloring BOOK! Along with an extensive menu that is sure to please all the littlest taste buds. Even the menu for kids is backed by their Menu Adventure Guarantee! Pat and Jackson had time to play an intense game of tic-tac-toe while we waited for our food! While they did that, Tyler and I enjoyed our tasty beverages. She was happy to hear they had her favorite, LEMONADE! I treated myself to a glass of their house made Caribbean Sunset Sangria. I will just let the picture speak for itself. It screamed summer and was DELICIOUS! We started with the Miso Shrimp Salad (Shredded Napa cabbage with fresh avocado, julienne cucumbers, daikon, edamame, carrots, red cabbage, green onions, cilantro, crispy rice noodles and crispy wontons tossed in a Miso dressing and topped with shrimp.) It was incredible. It was VERY fresh, bursting with many different flavors and textures. The Miso dressing was a real treat, a combination of sweet and spicy, it was the perfect compliment to all the vegetables. We chose to try the Four Seasons Pizza (Made with imported Italian tomatoes, oven-roasted artichoke hearts, salami, fresh mushrooms, mild onions, Mozzarella and fresh Mozzarella cheeses. Topped with fresh herbs and Parmesan cheese.) Do you see the bold mushrooms and onions, Pat does NOT eat mushrooms and onions, he would have NEVER ordered this pizza. NOT IN A MILLION AND ONE YEARS, but he grabbed a piece, didn't remove or pick anything off, took a HUGE bite and LOVED IT! He just kept saying over and over that he never would have eaten that pizza in a million years if it wasn't for this review. (PS-He took the leftover pizza to work for lunch today!) I LOVED IT! Sometimes when you get salami on a pizza it is soggy, and I HATE THAT, but this salami was crispy and crunchy and had a wonderful texture. I don't know if I enjoyed the pizza or watching Pat eat it more! This gives me hope that maybe I can continue to order mushrooms and onions on my pizzas from here on out? We also ordered the Cranberry-Walnut Chicken Salad Sandwich on Garlic Cheese Foccacia with a Caesar salad on the side (Chilled-grilled chicken breast, dried cranberries, toasted walnuts, celery, onions and mayonnaise, topped with sliced fresh Roma tomatoes and shredded lettuce). Pat orders a chicken salad sandwich EVERY TIME he sees it on the menu, and honestly, he is usually VERY disappointed. When we saw Chicken Salad was one of their new items, we knew we had to try it. I was pleasantly surprised. I am usually disappointed in chicken salad because it is bland, lacking flavor or overly packed with mayonnaise. This was the perfect combination of ingredients and won us over instantly. The garlic cheese foccacia was the perfect bread to hold such a dense sandwich that has a tendency to fall apart in your hands. It stayed in one piece and was easy to eat! Pat would DEFINITELY order this chicken salad again, and it is now at the top of his chicken salad list! The Caesar salad had shaved Parmesan cheese, which automatically wins me over, and the croutons, a staple in Caesar salad were PACKED with flavor! ANY THEN, after all this wonderful food, it was TIME FOR DESSERT! I had been hearing about the Butter Cake for weeks now. I even heard, "It will change your life!" I am NOT a sweets kind of person. I get my sugar intake through cocktails and wine! However, when it came to the table, the aroma was even too much for me to pass up, so I dug in. Warm, topped with ice cream, melt in your mouth, LIFE CHANGING! For me, my absolute favorite part were the crispy parts on the outside of the cake where the sugar had carmalized, harder than the soft cake inside, and when paired with the ice cream, it was a real TREAT! Jackson couldn't get the cake in his mouth fast enough, so he took these ENORMOUS bites! He is constantly practicing for his FRAT BOY days! We left with our bellies full and fun new memories of a special family evening trying new things. As we were leaving, Jackson, my future foodie, said, "This was a great idea for dinner, Mom!" Now it is your chance to win some "Pizza Dough" of your own so that you can be the hero in your family and treat them to a special meal at California Pizza Kitchen. There are three ways to win. (1) Leave a comment stating what your favorite California Pizza Kitchen pizza is! If you have never been, take a look at their menu and tell me which pizza you would like to try! Make sure you include your email or blog address! (2) Follow California Pizza Kitchen and myself on twitter @shakakan23 and send us a tweet stating that you would like to be entered to win Pizza Dough! Then, come back and leave a comment here that you did so. The contest will end Thursday at 11:59 PM MST! Winner will be announced on Friday! GOOD LUCK!!! 1. Jackson and Tyler have twitter accounts @crazylilpsycho1 and @crazylilpsycho2! They think it is GREAT FUN! My mom even got a twitter account so that she could follow them @robbie0912. 2. Father's Day was a whirlwind of activity! We went bowling in the morning, and then we went to Benihana for dinner. On a list of places I would choose to eat, Benihana would NOT make the Top 100. BUT, Pat LOVES it, and it was Father's Day, so we went, but I definitely didn't change my mind this time! By no means is it terrible, but I like FLAVOR, lots and lots of flavor, and I just don't find that at Benihana. 3. This house is OFFICIALLY done with pull ups! Sweet Jackson struggled, but something finally snapped, and I returned a package the other day! I am soooooooooo proud of him! 4. Now that I haven't been cooking myself, I am OBSESSED with the Food Network, I watch it all day and DROOL! 5. I went to see Get Him to the Greek with some friends the other day-HYSTERICAL! 6. I don't like The Bachelorette this season, I am hoping it is the girl, and that I am not out growing my love of TRASH reality television because I didn't really like Survivor either (unless Russell plays I have decided I will never like it again)! 7. Big Brother is starting soon! HOLLA! 8. Pretzel M & M's seem genius! 9. Why can't I think of something genius! 10. I swear this family has chlorine radiating from their pores during the summer! Do you guys watch the new show on Bravo, Bethenny Getting Married? I happen to ADORE her, and I am definitely Team Bethenny, and not Team Cuckoo for Cocoa Puffs Kelly! Anyway, in the show she is still pregnant, and she is discussing the birthing situation with her baby's daddy! She is giving strict directions that he is NOT allowed to look down there when the baby is born. He is to stand behind her head and not catch a glance of anything going on down there. I was laughing sooooooo hard listening to this whole entire conversation because I had the EXACT same one with Patrick before Jackson was born. THE EXACT conversation. He was to stand behind my head, whisper sweet nothings in my ear, and tell me how awesome I was doing! Someone should really clue us women into what REALLY GOES ON IN THE DELIVERY ROOM! When it came time to push, the nurse took one leg and directed Pat to take the other leg. There wasn't a moment for either of us to question the nurse. She's the boss, who is going to fight with her? AND honestly, maybe I thought about how weird it was that he was down there for about 30 seconds, and then it was time to push again! Two hours into pushing later, I am pretty sure the entire cast of Glee could have been down there, and I wouldn't have cared. After three hours of pushing, I would have invited Justin Timberlake to watch! I think I was sleeping between contractions! When Tyler was born, I promise you I didn't care who was down there, as long as someone was going to catch her as she came flying out. It makes me happy to know that celebrity or not, we all have the same concerns! Happy Father's Day Patrick! I wouldn't want to have shared this moment with anyone else! AND, just remember dads, you couldn't have this day without a lot of blood, sweat and tears put forth by the moms! If you were allowed down there, you know! The pictures don't even do it justice! I put curlers in Tyler's hair, and I am not kidding you, she had Snookie's perfectly positioned bump with lots of Jersey curls! HYSTERICAL! Pat saw her and started laughing IMMEDIATELY when I said, "She's auditioning for the Jersey Shore!" 1. First family pool party this afternoon! 2. I am DESPERATELY trying NOT to use the oven this summer, but it is so difficult to go from cooking my prepared frozen meals in the oven to cooking fresh. I feel like I am constantly going to the grocery store. 3. The oil leak GUSH is killing me. When they talk about the amount of money being spent on it or show pictures of once gorgeous beaches, it makes me sick to my stomach! 4. I SLICED my finger open yesterday cutting an onion. It totally hurts, and all I can think is "ROOKIE MOVE"! Do you think The Pioneer Woman still slices her finger open, or Bobby Flay? Probably not because they probably tuck their fingers under, LIKE YOU ARE SUPPOSED TO! 5. I think you are born a bully or not! There are these little girls in Tyler's class that terrorize her! SO ANNOYING! 6. I bought a bathing suit, I don't like it, but at least it doesnt come down to a V making me feel like I am exposing my lady parts to the world. 7. Pat still has the bathing suit he had when I first met him, now he has several variations in color, but SAME SIZE, he is OBNOXIOUS! 8. My garbage disposal STINKS! How much is it to replace the whole freaking thing. It is ruining my life! 9. I am about 15 times more tired at the end of the day in the summer than I am in the winter. It is so hot, I feel like my body is working overtime to try and stay cool. 10. Jackson needs another hair cut, but I still get very apprehensive when taking him to get his hair cut, so I put it off as long as possible! There is no other channel that seriously gets me as excited about television as BRAVO does! Real Housewives, makes me appreciate my life. Top Chef, makes me SALIVATE! Works of Art (or whatever the new art show is), makes me WISH I could do any sort of artistic thing! This is my public service announcement that you all must go check out BRAVO now! 1. BEST DAY OF MY LIFE! Got to do a Z'Tejas tasting today! OMG, I walked out stuffed. We had soooooooooo much amazing food, I encourage all of you guys to go try their new summer menu next month! INCREDIBLY FRESH! I felt like everything I had used amazing produce and definitely felt "summery"! Their new Skinny Margarita tastes JUST LIKE a regular margarita and a drinking gal didn't even know the difference! I was so happy the rest of the day, just knowing I was able to give feedback on food, and everyone there was so nice! Do you leave a tip or not at these things, very confused as to the situation, so I hope I didn't offend! 2. HOT!!!!!!!!!!!!!!!!!!!!!!!!!!!!! It is soooooooooooooooooo hot here. I can hardly take it! I am trying DESPERATELY to keep my air at 77, but DAMN, it is HOT! 3. Pat and I are going to Laughlin this weekend. He is DEFINITELY more excited than me! OMG! 4. Kids started summer camp today, first time they have been at the same school, they are thrilled and just keep asking if they will both be there tomorrow. What is going to happen in August when they are at different school again!?? SADNESS! 5. This family just made cookies. I don't need to eat any once they are baked because I am not kidding when I say I ate enough cookie dough to last a lifetime! YUM! 6. I am obsessed with Seattle, and I want a summer home there! 7. I love when I get told I look like my beautiful young SKINNY cousins, it makes me happy for days! 8. My grandma picked something up as a favor to me, and delivered me leftover pizza. How much do I love her? Even leftover food makes me happy. 9. I gave Shannon my leftover Z'Tejas because she watched my kids when I was running late to pick them up from school, and I have called her like 20 times to see if she liked it because I just LOVE to hear people's reaction to food. It doesn't matter if I made it, if I have tasted it, I like to hear what they are going to say about it! 10. If someone would give me a job in the food industry, I would be amazing. I was so happy today, my kids couldn't bother me because I was happy!!! THANK YOU Z'TEJAS! 1. Jackson is sick. He was throwing up all night. For me, it is bittersweet, Jackson has dealt with SOOOOOOOOOO much throw up in his short life, and it breaks my heart when I see him throwing up. BUT, at the same time, I am thankful he is the one throwing up because he knows how to do it so well, and it usually involves very little mess. Poor thing! 2. Don't think for a second that I haven't already blamed this illness on the fact that we went to the McDonald's play area yesterday! I HATE the McDonald's play area, but I was trying to think about what I would want to do if I was a kid and it was one hundred degrees! 3. I am COMPLETELY dumbfounded by people who get worked up about things on a blog. I am not kidding when I say the other day, there was a bunch of people debating whether or not people should have trampolines. REALLY, you have NOTHING BETTER TO DO than debate about whether or not SOMEONE ELSE should have a trampoline in their backyard. I just soooooooooo don't care enough about other people's lives to ever comment on these things. AND, I kind of think, "JUST DON'T READ THE BLOG IF YOU DON'T LIKE IT!" I don't write my blog to satisfy anyone else, I don't care if you agree with me, and I don't want you to always agree with me. Sure, leave comments and message me if you have a difference of opinion as several people have when I wrote about The Farm on Mother's Day! BUT, when commenting, I really wish people would stop thinking that they were going to change the other person's mind. Do you really think your comment is going to change years of feeling one way or another? I didn't like The Farm, I wouldn't go back, I didn't have a good experience, but I gave my reasons, and unless they start serving Diet Coke or Mimosas, Egg Benedict and get rid of the flies, it is not the place for me. . . BUT, I am happy these people enjoy it, and I hear great things about it from LOTS of people. 4. I HATE THE LAKERS, but I love Phil Jackson. 5. When Betty White dies, I feel there should be some sort of Golden Girls memorial opened up somewhere. I was so sad to hear about Rue McClanahan passing. Karissa and I used to spend hours watching The Golden Girls in college! We were SOOOOOOOOOOOO AWESOME! 6. The Shrek glasses at McDonald's have been recalled, and if you have them, you are to return them to the store and stop drinking out of them immediately. Some toxic chemical in the paint! REALLY!!! Why is toxic paint still in existence!??? 1. "Can one leave late enough? Early? Nobody is sick about being imaginative, that creates hestitation." You may be thinking-WHAT!? I went to prom with an editor of some sort of the school newspaper. I should have known it was a bad idea when we had to go on a "pre-date" to get to know one another (Might be why I hate Bamboo Club to this day!) before actual prom. I really thought we were going as friends. Soon after the ridiculous night where he followed me around, and I was hanging out with my friends (I could have been a little nicer I guess! ), the school newspaper came out, and he had written an article about prom in it. The "paragraph" above was the opening of said article. It spells out, Colleen is a b***h! I will say many years later that I wasn't the nicest of girls that night, but I don't think I was awful, I just think that we were not on the same wavelength, and that he wanted more than I did. I was very young and naive back then. I don't know who he told, but he told someone what the first sentence meant, someone told someone else, and pretty soon it made it all the way back to me! It wasn't the worst thing that has happened in my life, but at the time-OMG! The drama! I was 17 and this was circulating at an all boys school. I thought for sure my life was over!!! I somehow survived :-), but the pictures didn't! I burned all the prom pictures on my parents BBQ! 2. We went to Chompie's this weekend so that the kids could have a Suns bagel. It was flourescent Purple and Orange. Unfortunately it didn't bring the Suns any luck, but the kids were soooooo excited by it! 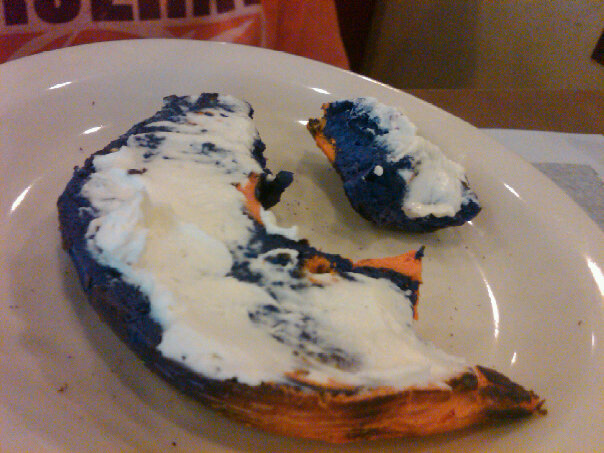 I have to say right now that their bagels ROCK! Crisp and crunchy on the outside, soft and wonderful on the inside, and by far the BEST Everything Bagel I have had in a while (I went with every intent of having one of the Suns bagels, but I couldn't eat it when I saw how bright it was)! I know it isn't the best picture, but hopefully you can see the swirled purple and orange! 3. I am going on a Pioneer Woman diet. What does this mean? Well instead of making something out of her cookbook almost every day, I might do it once a week! How does she eat like she does and look so wonderful!! 5. Summer camp cannot start soon enough! 6. I walked out to see Tyler had created her own little place to watch cartoons-SO CUTE! 7. Of course when she saw me taking a picture, she had to get up and talk to me, so I made her try on her new hat so I could snap a pic! 8. Last week I spoke of Tyler splitting her lip open, when in all actuality, that's not what happened at all! She has always had an attached upper lip frenulum (The upper lip frenulum is located under the top lip, in the center, and attaches the lip to the upper gums. In some infants, it is attached further down the gums. If your thumb and your finger in your mouth and reach up to the inner part of your lip, you can feel the frenulum.) It wasn't terribly noticeable, but it was further down than it really should have been. The doctor said that he was surprised she still had hers attached because most kids just tear them when they hit their mouth! ABRACADABRA-that's what Miss Tyler did last Tuesday! You can see in the above picture how much wider her smile is now, and how it is all healing. She looks like she has big HUGE lips now, but most of it is just healing gums! 9. I love that Tyler will bring me a Diet Coke in bed before I have to get up! Why didn't I get this girl a big girl bed sooner?! 10. Last week we met some friends at the park, I picked up Dunkin' Donuts donut holes for the kids and some iced coffees for the moms. Their iced coffee is the WEIRDEST thing I have ever had. I ordered it with cream and sugar, and it is almost like the sugar and cream never mixed in (DESPITE MUCH MIXING), so one drink would be sugary and sweet, the next drink would be bitter. It was like this to the VERY END!!! Why did I bring donuts to the park? BECAUSE WE WENT AT 8:15 because it is SOOOOOOOOOOO HOT!